At last a clever solution for feet with sensitive Bunions! You clearly loved the Fidelio Sandals, which were a huge success this summer, we now have the pleasure of introducing you and your lovely feet to the Fidelio Hallux Shoe for this winter. Pictured above in a sumptuous wine suede with croc leather detail, we feel sure that you will agree that they really are a stylish solution to painful bunions. How will these shoes help relieve pain? The secret to the success of Fidelio Hallux lies in the ingenious design of the stretchable insert that significantly relieves pressure upon your bunion. 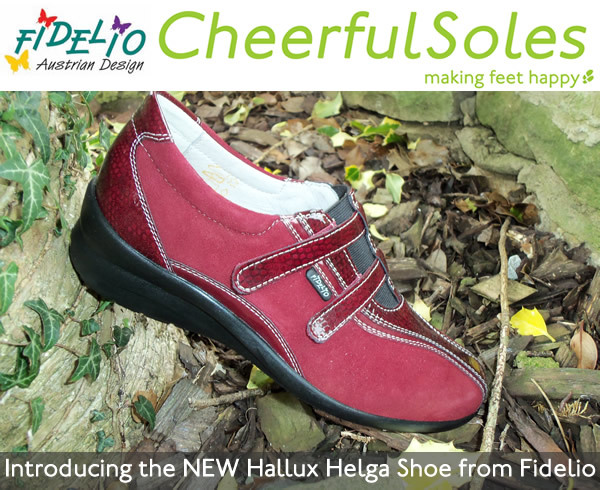 Fidelio Hallux is easily adjustable and the insert’s soft padding snuggles comfortably around your bunion whilst helping to hide unsightly differences between the left and the often more burdened right foot. When, as a last resort, bunions are surgically removed there is normally a period of a few months between each operation. It is at this time, when every step is painful, Fidelio Hallux through its adjustability, softness and anatomically formed removable insole can also be of great beneficial service. Can I wear my Orthotics with these Shoes? Yes, absolutely! All Fidelio shoes and sandals that we sell have a fully removable anatomical footbed. Once removed, there is plenty of room in these shoes for you to pop in your own custom or off the shelf orthotic.We have shown this brand to lots and lots of Podiatrists who recommend Fidelio to their patients and we are confident that you and your own Podiatrist will not be disappointed. What do you think, is there really such a thing as pain free shoes for Bunions? I don’t know about you but I do not personally suffer from bunions, I only know that many of you find it really hard to find shoes that will accommodate swollen joints and painful bunions. We think that we offer a great range of stylish footwear that are not only fit for purpose but look great as well. That said, we would love to hear what you think and we always encourage people to leave reviews of shoes that they have bought, particulalrly if you have problem feet as this may help others decide if it would be right for them. Feel free to write your comments below or visit our CheerfulSoles site to leave a review of the shoe you bought now.